Do you need a fast and effortless way to secure your data? The iStorage diskAshur DT represents the ultimate desktop hard drive and secure storage system. Equipped with an extremely fast USB 3.0 interface, the end user accesses data faster than ever before. 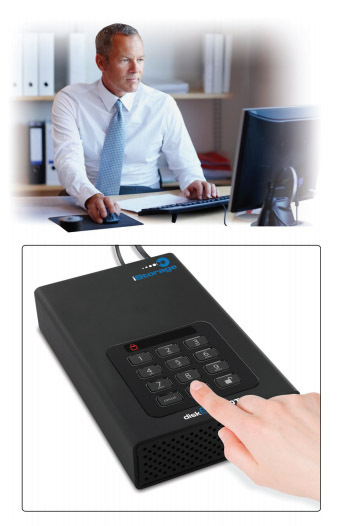 With an easy-to-use keypad design and software free setup, the iStorage diskAshur DT enables you to access the drive with your own unique pin, secure from intrusion or theft. Military Grade FIPS PUB 197 Validated Encryption: By employing AES-256-bit hardware encryption, the iStorage diskAshur will encrypt all data on the drive in real-time, securing your data even if the hard drive is removed from its enclosure. Software Free Design: diskAshur requires no installation of software for setup or operation and the ability to run on any platform, the iStorage diskAshur DT provides stress-free deployment in corporate environments. Its Administrator Feature will enroll up to five unique user ID’s and one administrator, making it a useful business collaboration tool. Fast USB 3.0 Connection: Data transfer speeds are available up to 10X faster than USB 2.0: The iStorage diskAshur DT is also backwards compatible with USB 2.0 and 1.1 ports. Brute Force Self Destruct: The iStorage diskAshur uses a three stage approach to protect against a Brute Force attack. The first step is to deny user access to the drive until the user PIN is verified. After several incorrect attempts the drive will lock itself and require the drive to be plugged in again to input a PIN. This feature will prevent and block automated attempts to enter PIN numbers and gain unauthorized access. Lastly, after a predetermined number of failed PIN entries, the diskAshur determines that it is being attacked and will then destroy the encryption key and lock itself, making the on-board data useless and requiring a total reset to redeploy the diskAshur. Variable Timing Circuit: Protection against numerous hacker attempts doesn’t stop with Brute Force. Included in the iStorage diskAshur’s electronics is iStorage’s Variable Time Circuit (VTC) technology, which will thwart “timing attacks” aimed at breaching the security on the drive by studying the behavior and infiltrating the diskAshur’s electronics. Sealed from Attacks by an Epoxy Coating: In addition to encrypting all of the PINs, data and the encryption key itself, the iStorage diskAshur DT adds another security barrier between your data and a hacker. A super tough epoxy compound protects the encryption chip and circuitry of the iStorage diskAshur DT, which is virtually impossible to remove without causing permanent damage to the electronics. This barrier will prevent a potential hacker from accessing the encryption circuitry and launching a variety of potential attacks. Wear Resistant Key Pad: Designed with protection in mind, the entire iStorage diskAshur family incorporates ‘wear resistant’ keypads, which will hide key usage and avoid tipping off a potential hacker to the frequently used keys. Data at Rest Protection: All data, PINs, and encryption keys are always encrypted while at rest. Encryption is dynamic and relentless. Auto Lock feature: Set the unattended drive to lock after a pre-determined amount of time. Did you know that millions of external data storage devices are lost or stolen every year and this figure is rising. Have you ever considered the impact of losing your non-encrypted USB hard drive? Your data would be at the mercy of anyone who stumbles across it. The information is readily accessed and downloaded from a non-encrypted USB hard drive. Loss of confidential data can have a devastating effect on both businesses and consumers. It could lead to a hefty fine, the downfall of a business, embarrassment, job losses and adverse media attention. The iStorage diskAshur can protect you against all of this.